We meet Chelsea, she's the second most popular girl in school, best friend to the most popular girl in school, Kristen. Drunk and confused, Chelsea can't help but spill the hottest piece of gossip she's seen all year, but at a crowded party, everyone hears, which Chelsea is fine with, until she sees the consequences. Then she is faced with an even bigger secret, one she's not sure she can live with, but telling would mean betraying Kristen, losing her popularity and the friends she knew. Blaming herself for everything that happened, Chelsea takes a vow of silence. And meets a couple of people she would have never given a second glance at before. This is a book that I really enjoyed, and by the end really liked. Though at the start of the book Chelsea isn't all that relatable or too be honest completely likable, she's believable. And I think that's one of the book's strong points, it's believable. Chelsea's popular, and she likes it, she has power, and as a teenage girl, yeh, she uses it. All righty, now I want to talk about some other characters. Sam, who can pull off a "retro navy sports jacket with patches over the elbows", yep 'nuff said... he's lovable, sweet and a good friend, but can be pretty tough. Asha, a sweet girl who doesn't know how to be mean. Noah, a boy caught on the end of the consequences. Kristen, the popular girl you'll love to hate. And Brendon, Chelsea's crush. 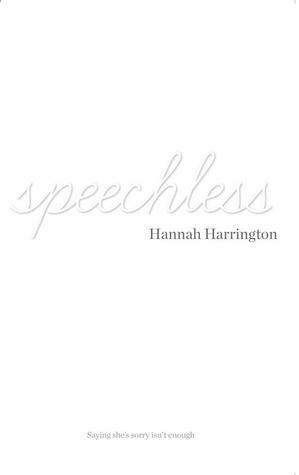 Speechless also brings up some serious issues, and it does this well. It can be hard for a book to sometimes go into the issues this book does, bullying, peer pressure and prejudices kids face because of their sexual orientation in high school, but not be too obvious and still keep the reader's interest. What I loved about the character's was that they were real, and each had layers, they weren't just one dimensional. They were well developed, so reading about them was genuinely interesting and not completely predictable.